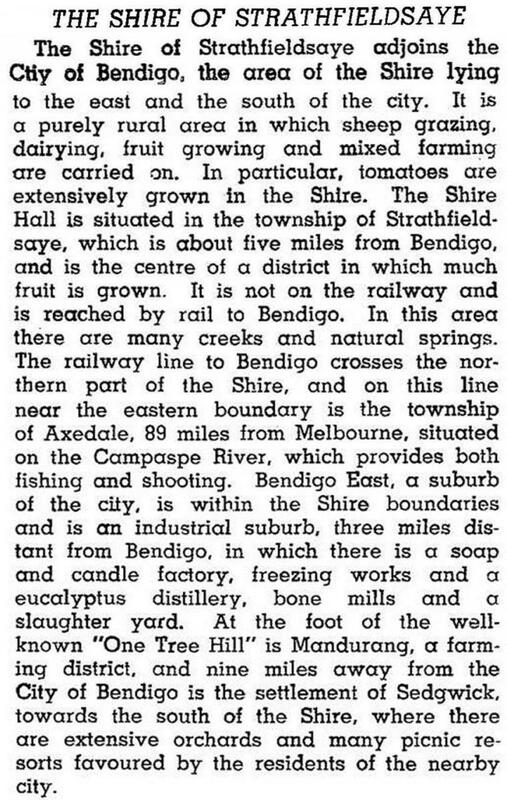 Strathfieldsaye Shire (1866-1994), immediately to the south-east of Bendigo, was proclaimed on 17 September 1866 and incorporated into Greater Bendigo city in 1994. It was named after the village of Strathfieldsaye. The shire had an area of 601 sq km, extending eastwards from the Calder Highway to the Coliban and Campaspe Rivers. Its main population centres adjoined Bendigo’s suburbs (Kennington and Flora Hill) and included Strathfieldsaye and Axedale to the east. The southern part of the shire included forested ridges with numerous streams and part of Lake Eppalock to the south-east. The McIvor Highway and the Heathcote-Bendigo railway line (1888-1958) were the main access routes from Melbourne. The shire’s administrative centre was in Strathfieldsaye until 1972, when new offices were opened in Kennington. The shire had an unusual succession of secretaries: Michael Brennan (1882-98), his son Richard (1898-1944) and Richard’s daughter Margaret (1946-77). The succession was possibly also a testament to the district’s strong Irish-Catholic community. During the 1970s Bendigo’s urban expansion crept beyond the State Forests, and rural/residential subdivisions were developed in Emu Creek, Strathfieldsaye and Junortown. Mandurang also experienced subdivisional development. A Catholic college was opened at Junortown and a LaTrobe University campus at Flora Hill, near the relocated Bendigo School of Mines. Between 1961 and 1991 the shire’s population tripled. In 1994, 42% of Strathfieldsaye shire’s area was used for farming, mainly grazing, carrying 60,000 sheep and lambs. On 7 April 1994, Strathfieldsaye shire was united with Bendigo and Marong Rural cities, Eaglehawk borough and Huntly shire to form Greater Bendigo city.